Sandy, a Tortie kitten, is friendly and playful and waiting for her special someone to walk through the doors of PAWS Animal Shelter. Selena arrived at PAWS Animal Shelter scared and confused, after a fire destroyed her family home and her family no longer could keep her. Over time, she has come to like people of all ages, although she’s a bit choosy when it comes to canine friends. She needs a new family to call her own. Shasta and Sheila are the last of four pup siblings waiting to be adopted from the Champaign County Animal Welfare League. A brother and sister already have left the premises with their forever owners. Drop by for a visit with the girls. 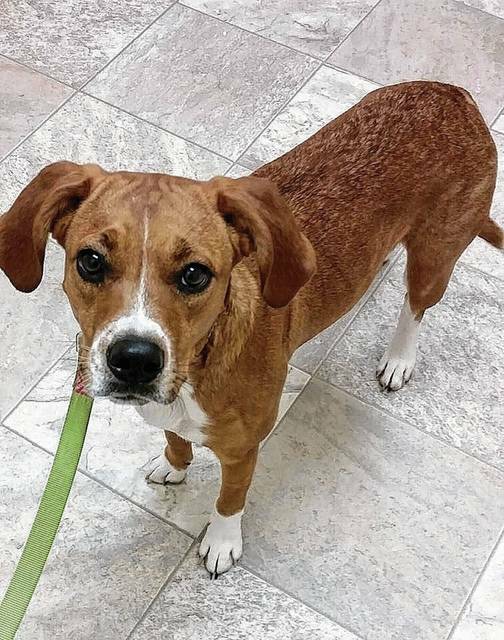 A young beagle mix, Booth is a little timid due to recent upheavals, but he’s sweet and just needs a loving family or individual. You can check him out at Barely Used Pets. This precious kitty is looking for a forever home. Open your heart and home to this adorable one for lots of fun! Sandy is a female Tortie kitten with a sweet personality. Her cute markings make her look like a surprised panther. This little girl would like nothing better than to go home with you. She likes to play with toys and greet everyone she meets. She would be thrilled to have a good home. Sandy has her shots and will have a spay certificate when adopted. She is litter box trained. Get your adoption application in as soon as you can, so you don’t miss out on this wonderful kitten. Stop by Paws Animal Shelter, 1535 W. U.S. Route 36, Urbana, Ohio 43078, or call Paws Animal Shelter at 937-653-6233. The Shelter hours are Tuesday-Friday 12-5 p.m., Saturday 12-4 p.m., Sunday and Monday-closed. You can email us at pawsurbana@hotmail.com. Visit us at www.facebook.com/paws.urbana. There are many wonderful cats, adorable kittens and fun-loving dogs at the shelter waiting for good homes. Paws Animal Shelter needs donations of Purina Kitten Chow, Purina Complete Cat Chow, Purina Dog Chow and Purina Puppy Chow. We also could use donations of bleach, laundry detergent, 39 gallon trash bags and clumping cat litter. Sweet Selena attended a PAWS Adoption Event at TSC in Bellefontaine. It’s amazing the personality that pours forth on these four- to five-hour Adoption Event treks. Selena arrived at PAWS after her pet parents suffered a fire that claimed their home. She arrived scared and unsure of her surroundings. 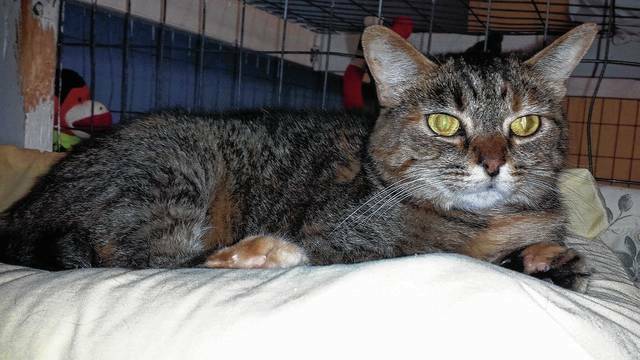 After the months she has been with us, she has blossomed into a very loving, kissable sweetheart. Selena loves all humans…. loves the kids and gave kisses freely to the children who approached her at the Adoption Event. She is still a bit choosy about her Canine friends, but with proper introduction and some patience, Selena will be a BFF. Selena is a spayed 3-year-old female Lab/ Pointer mix (at least, that’s what she looks like). She is a cuddle bug who walks well with a harness and leash and takes treats ever so gently. Selena was perfect with all the commotion and people at the Event and calmed very well with the interested patrons stopping by our booth. She preferred to lay and enjoy the peaceful “non-existent Shelter Noise”. 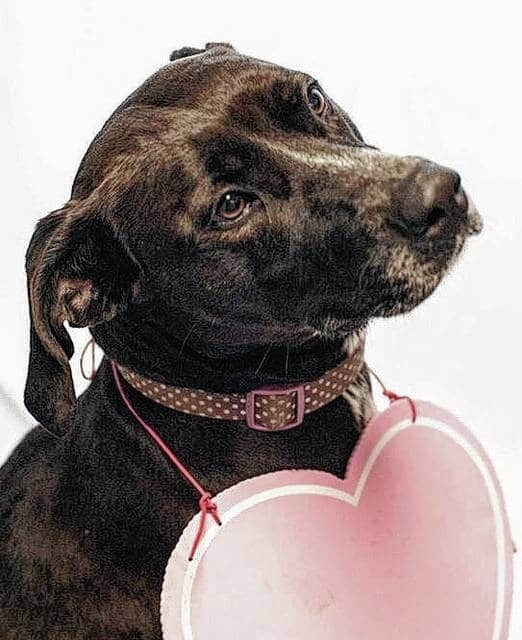 Selena is a sweet and loving girl who would love nothing more than to curl up by your feet and listen to your voice, receive your touch or attempt to be you LAP dog. Please stop by PAWS and meet this great little girl. She will be waiting for you. Two sweet litter mates from the Champaign County Animal Welfare League (CCAWL) are waiting for your visit. Both Shasta and Sheila are 5 ½-month-old Hound/Lab mixes. They along with another sister and brother came to us from another shelter where they had been left in the overnight drop. The brother and sister have gone on to their forever homes, leaving these two looking for their homes. The whole litter was pretty much emaciated and had Demodex mange. After coming to CCAWL, they have been successfully treated for mange, spayed, heart worm tested, fully vaccinated and treated with flea and heart worm prevention. They both have also been micro-chipped and will come with their 2017 dog license. The girls are not house-broken but are eager to please. So with a little patience and a schedule, they could easily obtain this milestone. You may visit the sisters at 3858 state Route 56, Mechanicsburg, or give us a call at 937-834-5236. We are open every day except Sunday and Tuesday. This Saturday – July 1, we are closed for training and orientation. We also have a wide range of other dogs, big, medium and little who are anxious to meet their new owners. The Champaign County Animal Welfare League is a nonprofit organization that relies on public support and donations. We welcome your donations of collars, harnesses, leashes, laundry soap and bleach. If you think you would like to volunteer, we have a wide range of duties that might appeal to you. Just stop in and fill out our volunteer application. We would love to meet you. My name is Booth. I am a one-and-a-half-year-old beagle mix. I came here from a rescue in Kentucky that had a fire. I was so scared and I am so grateful that I got out alive. Some of my friends got out with me and they got to come here, too. I am a little timid right now because there have been so many changes for me lately. They say I am not a victim…but that I’m a survivor! It is so nice here with lots of others to play with. They say I am very sweet and I am working to learn to walk on a leash right now. I just need a family of my own to help me find happiness again. Won’t you please come out and see me and maybe we can do a little leash walking so I can show you what I’ve learned! I am a really good boy and I promise to be the best boy you ever, ever had! https://www.urbanacitizen.com/wp-content/uploads/sites/36/2017/06/web1_IMG_9871.jpgSandy, a Tortie kitten, is friendly and playful and waiting for her special someone to walk through the doors of PAWS Animal Shelter. https://www.urbanacitizen.com/wp-content/uploads/sites/36/2017/06/web1_IMG_8321.jpgSelena arrived at PAWS Animal Shelter scared and confused, after a fire destroyed her family home and her family no longer could keep her. Over time, she has come to like people of all ages, although she’s a bit choosy when it comes to canine friends. She needs a new family to call her own. 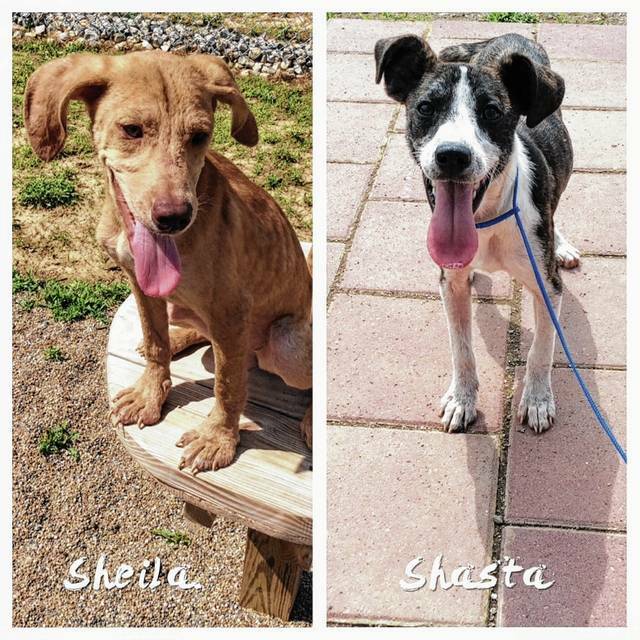 https://www.urbanacitizen.com/wp-content/uploads/sites/36/2017/06/web1_2017-Sheila-and-Shasta.jpgShasta and Sheila are the last of four pup siblings waiting to be adopted from the Champaign County Animal Welfare League. A brother and sister already have left the premises with their forever owners. Drop by for a visit with the girls. https://www.urbanacitizen.com/wp-content/uploads/sites/36/2017/06/web1_Booth-6-28-2017.jpgA young beagle mix, Booth is a little timid due to recent upheavals, but he’s sweet and just needs a loving family or individual. You can check him out at Barely Used Pets. Information submitted by Champaign County rescues and shelters.